General Description: Canyon Hot Springs​ is a great family hot springs destination. Canyon Resort is located in mountains of Albert Canyon situated between Glacier and Mount Revelstoke National Parks in British Columbia Canada. Canyon boasts two hot spring pools. Accommodations are available. Location: From Calgary, Alberta, Canada it is 375 kilometers or about a 4 hour drive to the hot springs. 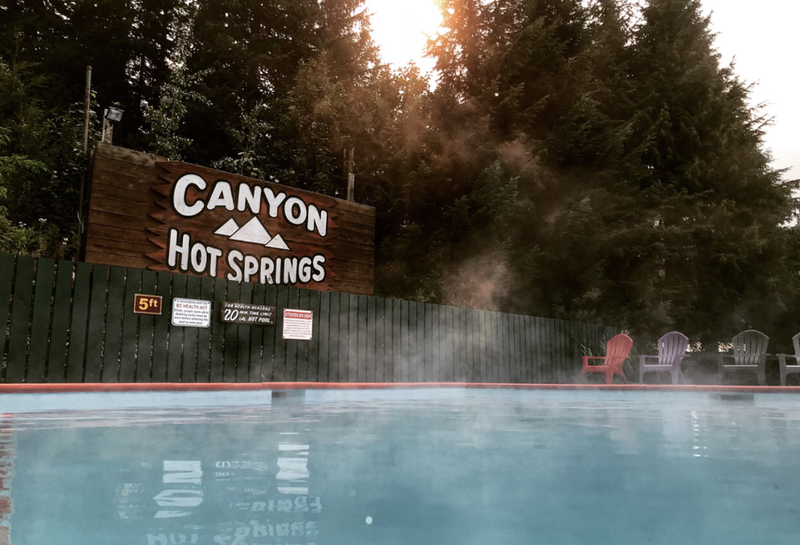 Accessibility: Canyon Hot Springs​ is accessible. You can drive up to the hot springs. It is an easy walk around the property. It is a large resort. The pools are handicap accessible. Hot Springs: ​Canyon Hot Springs hot spring source is piped 2 miles away to feed the 15,000 gallon hot springs pool and our 60,000 gallon hot springs swimming pool. The Hot Spring Mineral Soaking Pool temperature is 104°F (40°C) and the Hot Springs swimming pool is 86°F (32°C). The water is treated. The water is not all natural. Hot Spring Tips: ​Canyon Hot Springs offers camping, RV hookups and cabins. Camping does include access to the Hot Spring Mineral Pools. Day use is available if you are not a guest. Day use needs to be purchased for campers. Children under 4 years of age are free. This resort is pet friendly. No dogs in the pool area. Dogs must be leashed at all times. Explore the giant cedars and climb a glacier when you are visiting. Clothing is required. Bring your bathing suit. There is a store at Canyon Hot Springs for supplies. Youtube Video on Canyon Hot Springs is below.